M35 is a beautiful open cluster in the constellation of Gemini. Being a young cluster of a mere 150 million years, M35's stars are primarily blue in color. In this cluster, the brightest stars are also the hottest stars and radiate more heavily in blue. However, these bright, hot stars also live comparatively short lives. Similarly, the cooler yellow and red stars live much longer than their blue cousins. Resultantly, as star clusters age, they tend to become more yellow in color. This effect is quite obvious in this image. The "smaller" cluster in this image is NGC 2158 and is about four times as far from us as M35. NGC 2158 is also about 10 times older than M35. Due to its advanced age, all of its blue stars are no longer burning. 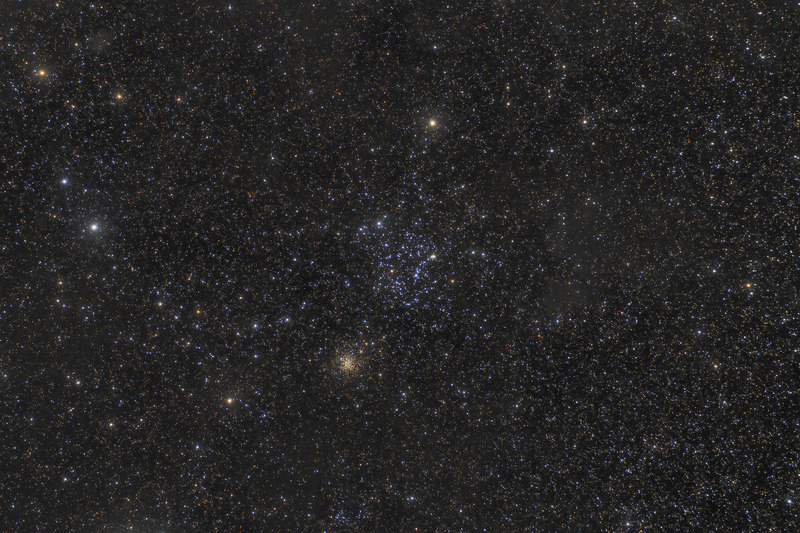 For this reason, the color of this cluster is dominated by the cooler, longer lasting yellow stars. In addition to the two beautiful and contrasting clusters, this image also shows some uncommonly photographed dust (strongest to the right of M35 and then flowing along the bottom of the image and more subtly towards the left). In processing this image, I made a point of capturing far more data than is ever needed to show open clusters well. My purpose was to see if there was any faint dust to be revealed in this field of view. Although it is quite subdued this very deep image does, in fact, show some of this dust. I have been unable to locate any other images showing any of this dust. While I'm quite confident that this is not a processing artifact, I cannot be certain if this is interstellar dust (dust between the stars and within the plane of our galaxy), or much more distant IFN (Integrated Flux Nebula - dust outside our galaxy that reflects the light from the entire Milky Way Galaxy). My best guess is that this is interstellar dust, as it appears in some places to be blocking the view of background stars (all of which would be within our galaxy). Whatever the origin of this dust, I'm quite thrilled to have captured such a highly attenuated signal. In this image, North is to the Right. This image is cropped to 89% of the original full frame. Software Used Images Plus 6.0 for camera control, Images Plus 6.5 for calibration, stacking, color channel splitting and recombination, ArcSinH stretching, star size reduction, edge masking, and masked stretching. Photoshop CS5 used for levels and curves, lab color, saturation adjustments, selective color, and match color. Gradient Xterminator for gradient removal. Carboni Tools for additional noise reduction and smoothing. HLVG for additional color correction. Registar 64 for subexposure alignment and color channel alignment. Pixinsight 1.8 for morphological transformation. Focus Magic for focus restoration. Notes I'm very thrilled with this image as I always enjoy capturing features that are not often photographed. I think the clusters and stars themselves look quite good, and the faint dust punctuates the overall view.